Following the 2008 Olympic Games in Beijing, the human rights situation in Tibet has been deteriorating. However, Beijing is now among the candidates to host the 2022 Winter Games. Consequently, a coalition of 175 organizations has handed in a report to the International Olympic Committee (IOC), urging the committee not to consider Beijing’s candidature. 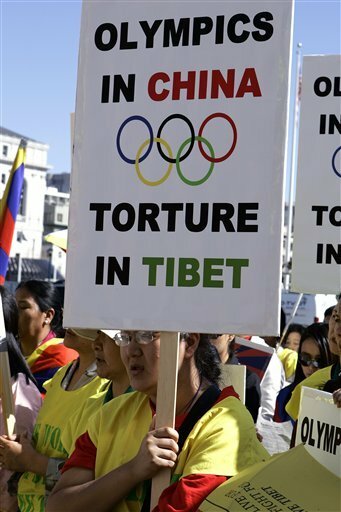 A coalition of Free Tibet groups urged the International Olympic Committee on Thursday to drop a bid from Beijing for the 2022 winter Games over its human rights record in the region. A group of 175 organizations will be handing in a report to the IOC later in the day on what it claims is a deterioration of the human rights situation after the Chinese capital hosted the 2008 summer Games. Supporters of autonomy for Tibet, a remote Himalayan region ruled by the China since its troops marched in 1950, say human rights had not improved as was expected while repression increased. "The old saying goes ‘fool me once, shame on you. Fool me twice, shame on me’," Alistair Currie of the Free Tibet organization, who co-authored the report, said in a statement. "The IOC wanted to believe that China would get all dewy-eyed and idealistic under the influence of the 2008 Games. The reality was that instead of increased sensitivity to human rights in Beijing, we saw increased self-confidence that abusing human rights was no problem on the world stage." Beijing is campaigning to land the winter edition of the Olympics, with Kazakhstan's Almaty the only other candidate. The IOC will elect the winner in July. Free Tibet and human rights activists disrupted the 2008 Olympic torch relay at several international stops while also protesting during the torch lighting ceremony in Olympia, Greece. The IOC has since dropped international legs from its Olympic Games torch relays. Tibet's exiled spiritual leader, the Dalai Lama, said in December the Chinese government was holding back President Xi Jinping from granting genuine autonomy to Tibet.